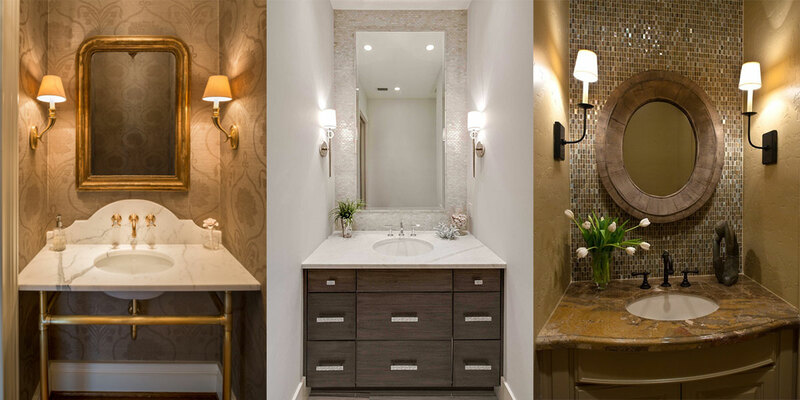 These three lovely examples of half-bathroom vanity walls all have on thing in common; the wall sconces have been installed on the side walls. They are all still at about eye level, but 12″ from the corner, it cleans up the narrow wall on which the mirror is mounted and brings delicious light closer to your visage. The first example is by Archer & Buchanan Architecture Ldt., the second is by 41 West. I would love to see an example of this in which a frameless mirror takes the entire remaining wall space (full width and full height above the vanity), this would allow the sconces themselves to be reflected, adding more light. A metallic grasscloth wallpaper would also highlight the side walls beautifully by carrying the light from the sconces along the reflective finish.